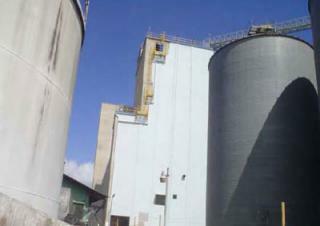 These silos for National Flour Mills were waterproofed with Radcon Formula # 7® by our representative in Trinidad. National Flour Mills was originally formed in 1966 and was listed as a Public Company on the Trinidad Stock Exchange in 1995. Since then the Government has had a 51% shareholding. The Company is at the forefront of Trinidad's flour milling and feed milling industries, producing a total of over 130,000 tonnes of flour and feed mill each year. Given the nature of what the silos hold, it was important to the client that the product they chose was compatible with food storage and thus Radcon Formula # 7® was a natural choice. It is "the world's most environmentally friendly concrete waterproofing" and has numerous certificates from around the world to prove its non toxicity and suitability with potable water. This has also been proven over many years in the field where it has been used in aquariums containing marine life, who are the most sensitive creatures on the planet to any form of toxicity.